After a big weekend of adventures for MS and I (no Amateurs for us) we didn’t feel like cooking nor going anywhere for dinner last night. With a penchant for something deep fried we both decided on a good old serve of fish and chips for dinner. We tried the Earlville Fish Bar but their phone rang out. We drove down to Sheridan St to Sheridan Gourmet Seafood to see if we could get some there but by all accounts they appear to have closed down. So we went a little further along to another Fish and Chip shop on Sheridan St near the IGA (can’t think of the name) but apparently they had run out of squid. That was a deal breaker (I WANTED SQUID) so we drove further along to Ocean World but they close at 7pm. After a bit more driving around we ended up on Pease St at Ramsden’s Fish and Chips and after some umming and ahhing we ordered a serve of chips, two pieces of battered Spanish Mackerel, 5 pieces of Salt and Pepper Squid, 5 pieces of Calamari and some Tartare Sauce for AU$24.40. It was good, not amazing and the serving size was ok but I guess I am still stuck in 1998 when a couple of bucks got you a mountain of chips from the takeaway shop across the road from my high school. Anyway, the purpose of this post is to find the Best Fish and Chips in Cairns. As a local I am ashamed that I have no idea where to get good Fish and Chips anymore so I am calling on my readers to help me out. Where can I get the Best Fish and Chips in Cairns? 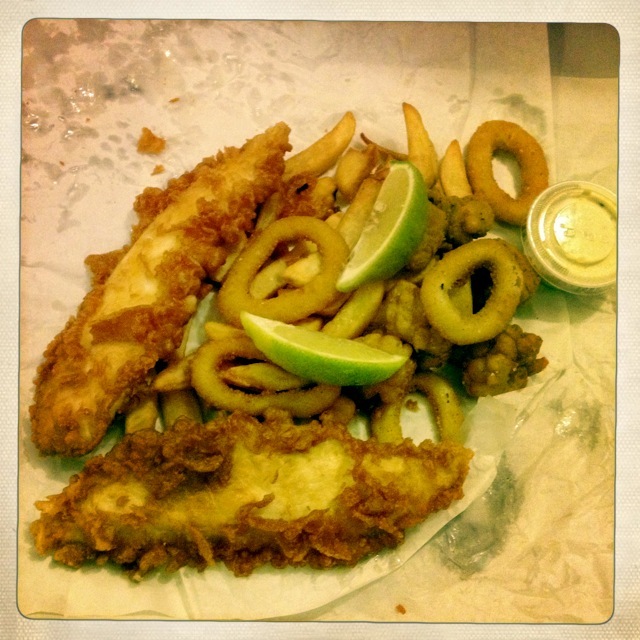 Posted on September 10, 2012, in Cairns and tagged Cairns Food Blog, Fish and Chips. Bookmark the permalink. 25 Comments. You should definately try Ocean World. It’s not my local fish and chip shop but when I’m on that side of town I grab some from there and I’ve never been disappointed. This is something I have also previously posted on and lamented! The Fish’n’Chip scene in Cairns is lamentable! Which is strange particularly given the numbers of English tourists we get! There is no ‘signature’ place at all which instantly comes to mind? As an Esplanade dweller in the past I have been specifically asked by tourists where they can go to get some good Fish’n’Chips and i could suggest nothing! So true. Cairns Fish and Chip scene is pretty much non-existent. I can’t even think of somewhere good to go myself let alone give tourists the heads up. We need a good Fish and Chip shop on the Esplanade that’s for sure! I suggest you try Apex, they have new owners (again!) and we find them quite good 🙂 downside is that they close at 6pm and aren’t open weekends. Hava snack in piccones on Pease st has the best fish n chips And really good burgers, they are open 7 days 7am- 8pm sun-Wed and 7am-8.30pm Thurs-Sat. And their calamari are fresh. Try Davina’s in Freshwater, the BEST chips! so deliciously good, and the fish is always cooked to perfection! Thanks EW I’ll have to remember that one! The one near IGA on Sheridan is so good! (Can’t think of the name either) they do great packs which include a salad of choice, the fish is always fresh and yummy and the potato scallops are amazing! They are super friendly too! The Kewarra Beach Fish and Chip shop is excellent. Bransfords at Clifton Beach has a very unattractive bain marie. They make great fish and chips. Can’t go past the Whitfield Takeaway on Brooks St though. The Home made Thai spring rolls are a definite winner. Menu includes mackerel, flake, Barra and coral trout, also do pasta and pizza and the burgers are superb. Best fish and chips is Splash at Smithfield Campus shops where KfC is. You will not get better anywhere. 4. (This include adding salt and pepper for taste) And lastly, put the mixed ingredient into your pepper and put it into the slow cooker. 4 medium red potatoes, cut into pieces. I agree. The fish and chip scene in Cairns is abyssmal. What’s the point of living on the front step of the Great Barrier Reef, if you can’t enjoy the benefits of its bounty. I’ve tried heaps of fish and chips shops around town and there is just NO one place where you can get good fish and chips. I used to go to Earlville Fish Bar as you got a decent piece of fish, unfortunately they closed. Pretty sure they have re-opened (new managers??? ), but I haven’t been back to verify if it is just as good. I’m currently using Rex’s Burger Bar on Sheridan St. I haven’t yet been disappointed about the size of the fish. Grumpy old asian women behind the counter tho. The chips are ok. The best chips I have found are at Davina’s in Freshwater, you don’t get a lot for what you pay though. Unfortunately their fish is the same small pieces you get most places. Places to stay clear of are SPLASH at the Campus Shopping Centre. OMG, getting chips their is like a licence for them to print money. I have never encountered such expensive fish and chips and you still don’t even get much. I also only just got fish and chips and chicken nuggets from Bransfords at Clifton Beach. I am so fed up of these stores having in large print ‘Best Fish and Chips in Town’. What a load of garbage. The chips were soggy and not the best flavor, the chicken nuggets were reconstitued chicken not breast, horrible taste and my worst comment is for the fish. Since when has mackeral been 1 inch wide. This must have been a baby mackeral for a 1 inch wide fillet. WTF. It was dry, pathetic size and the crumb must have been homebrand crumb mix. It has left me angry that I have been so ripped off. Have you ever been to Café Anderson on Anderson Street, across from the Ambulance Station. There are no signs claiming, in Large Print, to have The Best Fish and Chips in Cairns . Their chips were CRUNCHY and stayed that way for a time, but have FLAVOUR. Their fish is of Great size (sometimes they have had to break the end a little to fit in the box.) Good serving size for their prices. Best customer service I have had. Hi Natalie! For some reason your comment has only just shown up now on my site! I am very sorry for the late reply 😦 no I haven’t been to that place since it changes from Annabels bakery a few years ago. Thank you very much for the tip! Cafe 33 in Stockland Earlville (opposite Sanity) has best fish and chips but only open during centre hours. Mt Peter Foodstore in Edmonton is by far the best fish and chips in cairns. The new owner is a Chef and the quality is the same everytime. Descent serves too. The Earlville Fish Bar on Mulgrave Road – absolutely the best fish and chips in Cairns. The new shop is stunning – room for the whole family. Avria Cafe, Mobil Service Station, Bruce Highway, Edmonton. Without a doubt the best fish’n chips – you’ll be back for more! Keep it in mind when heading down the highway to and from Cairns.